Goats are extremely curious animals and great climbers, known for their ability to climb and hold their balance in the most precarious places. Moroccan goats climb the Argan trees to eat argo nuts and Alpine ibex cling to a near-vertical rock face of a northern Italian dam to lick salts. When Charles Back brought goats to his Fairview Cheese and Wine Farm at Fairview in South Africa, he feared that the goats would miss the vertical aspect of their natural habitat in the flat yard of his farm house. 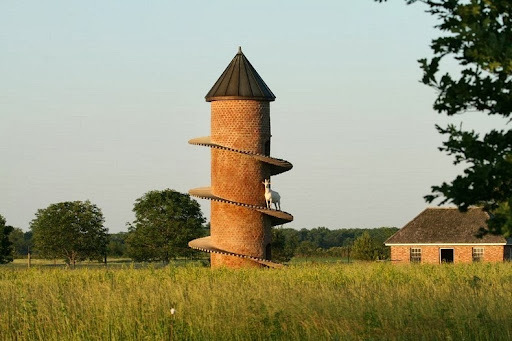 So he decided to build a tower for the goats. 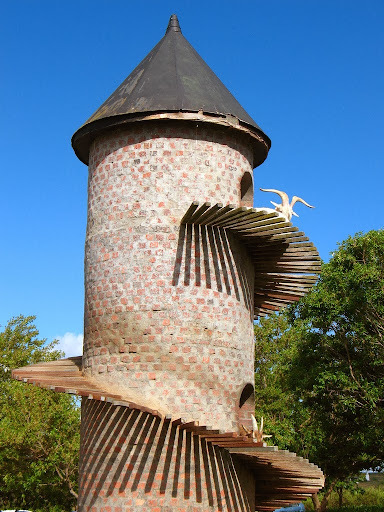 The goat tower is basically a multi-story tower built out of brick and mortar with a spiral wooden ramp on the outside leading up to the top. The tower includes windows with shallow floors so the animals can shelter inside in their own ‘rooms’. Since its creation in 1981 the tower has become the most identifiable symbol of Fairview Wine and Cheese. 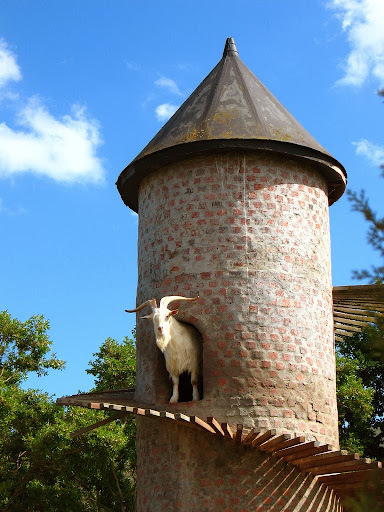 The first goat tower was built by Fernando Guedes da Silva da Fonseca (1871-1946) at Aveleda, one of the oldest and most famous wineries in the Vinho Verde region of Portugal. The one at Fairview is the second, and now copies of the original have started appearing elsewhere around the world. 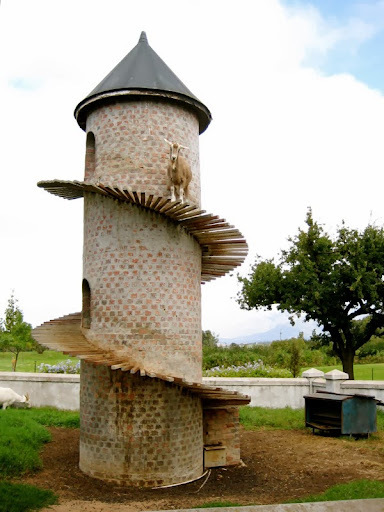 There are now known goat towers at Ekeby Farm in Moss Norway, at a bar in Memphis, Tennessee called “Silky O’Sullivan”, and the “Tower of Baaa” in Findlay, Illinois. 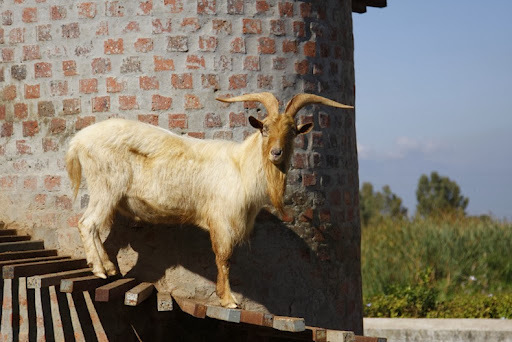 The “Tower of Baaa”, built in 1998, is reportedly the highest goat tower in existence with a height of 9.5 meters and diameter of about 2.1 meters. 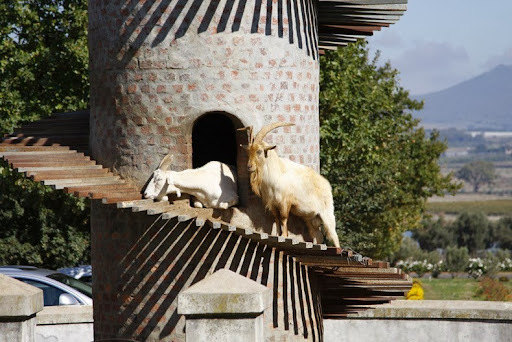 Its 276 spiral shaped concrete steps allow the goats to climb up and down with ease passing each other on the ramp.